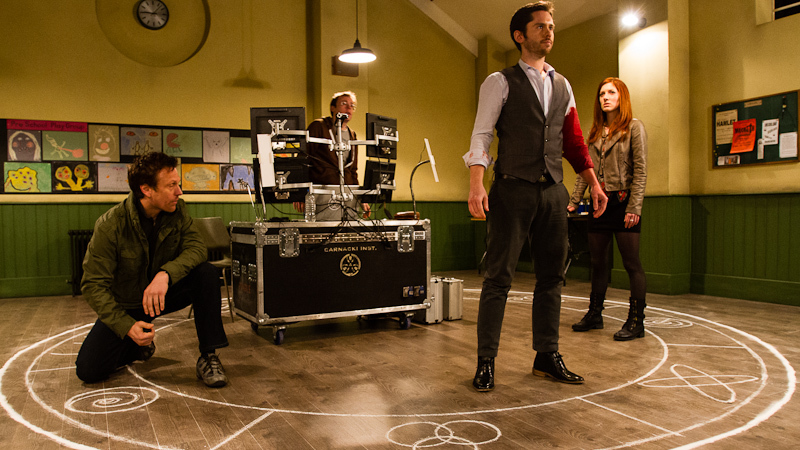 A team of professional ghost finders are trapped in an old village hall. The haunting they set out to investigate turns out to be far worse than they anticipated. Who will survive and what will be left of their souls? Judas Ghost is one of those horror movies that you can never be quite sure about. Like it’s great uncle, Paranormal Activity, it features a group of people wandering around with cameras looking for some ghosts to help out. However, unlike the Paranormal Activity movies the people featured in the film are meant to be professionals, even if they don’t always act like it. This band of misfits it headed by Jerry (Martin Delaney) a cocky know it all paro psychologist (imagine Dr Kieran O’Keefe from Most Haunted but without the cockerel hairdo) who along with psychic Anna Gilmour (played by slight Karen Gillan lookalike Lucy Cudden) alongside cameraman Mark Vega and tech chap Ian Calder. For a good part of the movie we get a lot of standing around in a room. Unlike Paranormal Activity which spent most of its time wobbling around like a drunk car salesman attempting to sell a moving vehicle to someone who is already in it, Judas Ghost spends a lot of time still. This is partly down to some great camera work but also partly because our gang spend a good part of the film locked in one area meaning we have to sort of just watch them being frightened and standing around. It can at times seem a bit grating but it could have worked if more action had occurred during the film. The acting is good with Martin Delaney seeming to be pretty genuine as the cocky paranormal investigator. However, the rest of the cast are less strong with Cudden seeming a bit wide eyed and dreamy throughout and the other two mains not really making an impression. Maybe with a bit tighter direction the actors could have come more out into their own but otherwise they seem a bit limp even though you can see that they are trying. Judas Ghost is the type of film that teenagers will watch when they are sitting down with their friends on a Friday night laughing and joking. It has some decent jump scares and what it lacks in substance it makes up for in leaving an impression on the viewer.